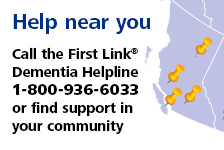 Advocacy: speaking up about dementia | Alzheimer Society of B.C. Have you ever wondered what you can do to make lasting social change for people with dementia and their families? There is a role for you! We invite you to join the Alzheimer Society of B.C. in helping make Alzheimer's disease a B.C. priority. This tele-workshop will give you the tools you need to advocate for a dementia strategy in B.C. Lasting change can’t happen without your voice. Barbara Lindsay, Director of Advocacy and Education, Alzheimer Society of B.C. Rebecca Morris, Advocacy Analyst, Alzheimer Society of B.C.